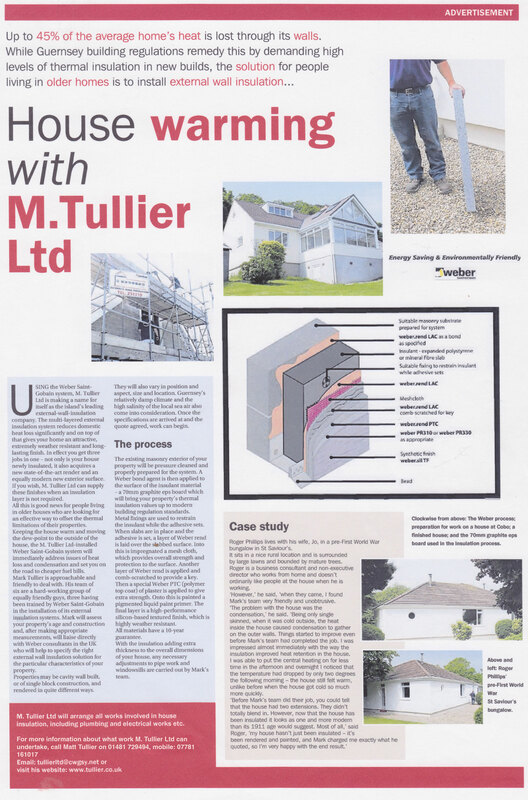 Tullier Ltd are a local Guernsey company formed by Mark Tullier. The company has a vast amount of experience in the building and wall insulation industry, all works undertaken are finished to the highest standard and above all are guaranteed. Using only products from Weber Saint-Gobain, Tullier Ltd are able to offer locally one of the worlds leading products in external wall insulation. Please browse the website for further details about the Weber Saint-Gobain group, Weber.Therm XM and Weber.rend MT. Tullier Ltd are also able to provide the following Individual building services: block-laying, plastering, thermalboard internal wall insulation, carpentry, painting and decorating, ceramic tiling, patio, footpaths and concrete drives, drain-laying and repairs and general property maintenance. Contact Mark today on 01481 251310 for an informal chat about your project or to request a site visit.